Earlier this month, Apple Music announced it will open a content-creation office in the restored, historic May Hosiery complex, with 30,000 square feet of office space and an outdoor event space. The SoHo House hotel will open next door. The former hosiery complex is a series of buildings abandoned as a factory in 1983 and is being transformed into a mix of business, retail, restaurants and offices. May Hosiery was one of the largest employers in Nashville in the 1900s and even made socks for Neil Armstrong and Buzz Aldrin to wear on the moon. Houston Station is home to Hemingway’s and Bastion restaurants, as well as office, retail and studio space. It also houses Refinery Nashville, a coworking space for entrepreneurs and innovators. Colby Sledge, Metro Councilmember for District 17, says the announcement about Apple Music moving into the area is good for the neighborhood because it provides a reliable, solid tenant with global recognition. 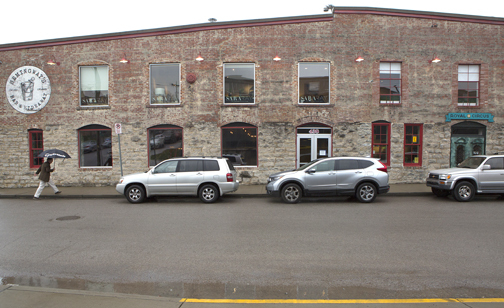 “We have created a kind of business district in Wedgwood East and the surrounding area. And having those kinds of reliable workers during the day, they can help with the business ecosystem when it comes to getting lunch, or getting groceries or grabbing a beer after work, they can really benefit the small businesses that are around that whole area,” he says. Still, there is plenty the neighborhood needs to have in order to encourage more people to live and work there. “We have a great market, Sassafras Market, that’s really good for a good bit of grocery shopping, but we still need some other kind of services if we’re going to become a walkable area,” Sledge adds. Gill, who also lives in WeHo and walks to work, wants to see the neighborhood remain local even though he knows larger businesses with deeper pockets are going to start to see the appeal too, especially with its proximity to downtown. “We just don’t want the mall kind of stores popping in, taking up spaces in the neighborhood. We want to support local businesses, and we hope to see more unique local businesses come to the neighborhood,” Gill says. Mark Deutschmann, founder of CityLiving Group at Village Real Estate – recently purchased by Central Real Estate Partners – and Core Development, opened another office in Wedgewood-Houston on Martin Street in June. He has worked to promote walkable areas in emerging communities like WeHo, where he has also completed, The Finery, a mixed-use development. He says he would like to see a Greenway connector from Brown’s Creek at the fairgrounds down through the neighborhood and past Greer Stadium and into the city. “I think walkable and bikeable access is something that would connect the neighborhood to other neighborhoods and create an alternative transportation opportunity,” Deutschmann says. 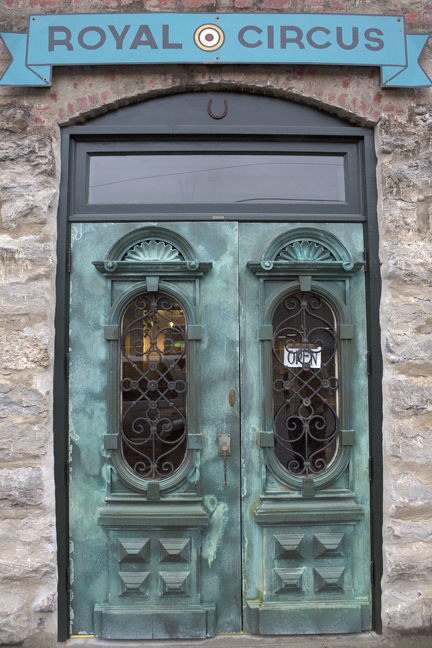 Beautiful iron doors welcome visitors to Royal Circus furniture store on Houston Street. 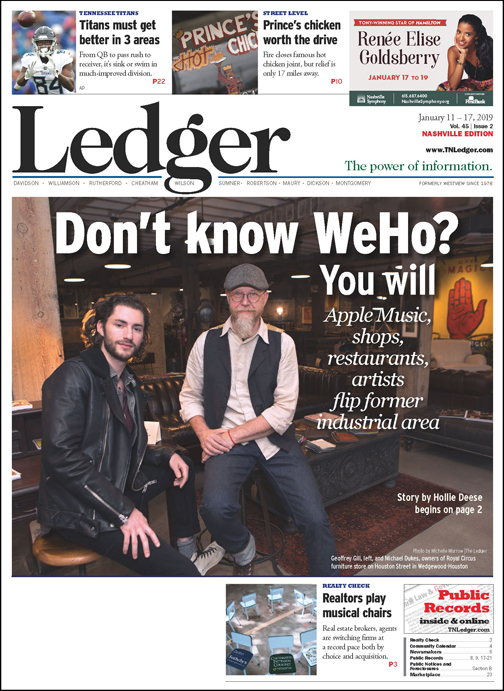 And even with the Apple Music announcement Sledge says they still have to have more “daytime heartbeats,” where people are coming to the area, working, and spending money at those businesses, and then when it comes to evening and weekends, residents are patronizing those services and businesses as well. 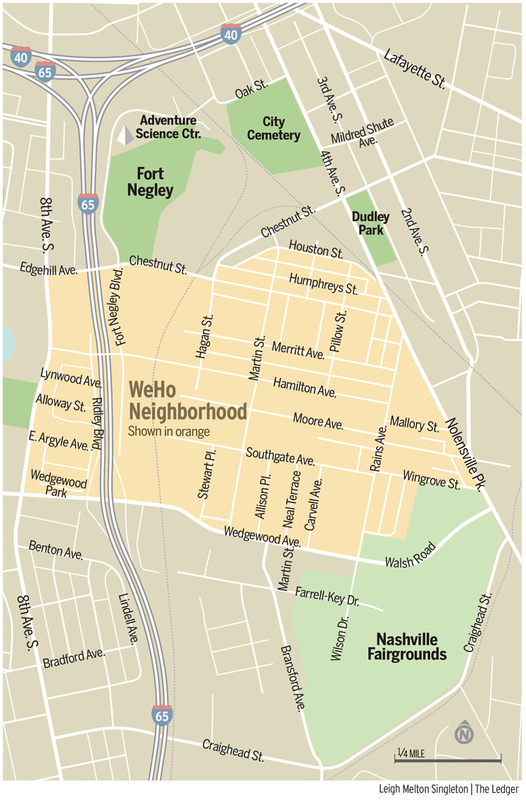 “We are still seeing that even among longtime Nashville residents, a lot of people simply aren’t aware of Wedgewood-Houston as a destination, as an up and coming neighborhood,” Dukes acknowledges. “It’s getting better all the time, and having Bastion and Hemingway’s down here has certainly been a big part of that, but I feel things like Apple Music getting so much press, it has a tremendous power to validate this neighborhood. The Finery from Core Development encompasses an area the size of a city block, with more than seven acres of industrial land for development planned over the next five years. 1260 Martin is Core’s newest development at The Finery, and that project reflects the creative, maker culture already present in the neighborhood, with first-floor flex space within the townhouse units. That includes Diskin Cider, Jackalope Brewery, Nashville Craft Distillery and Corsair. The week before Christmas the board of zoning appeals approved an application for 150 micro-units in the industrial part of the neighborhood, about a block from the May Hosiery building, Sledge says. The units will be at Humphreys and Martin Streets. “These are maybe the first true micro-units that we’ll have in the city,” Sledge explains. He says they will average 200 square feet each and with all utilities included, rent for around $950 a month.